So who does not love Sneakers these days? Everyone today owns at least a pair of sneakers in their shoe closet. Unlike the olden times, it is all about the comfort. Comfort and casual dressing wins over anything is my belief. I would choose to wear this outfit for a day out, for a day with friends, to the mall, for shopping or anything. It is one of most comfortable OOTD's for me. I have worn this super casual gray maxi dress with double side slit from Koovs.com. I personally love everything from Koovs.com, they always seem to have everything that comes in trend. I shop from Koovs every other time and they definitely know how to keep a customer happy. They have sales quite a few times, so girls looking for some crazy stuff at affordable prices then Koovs it is. 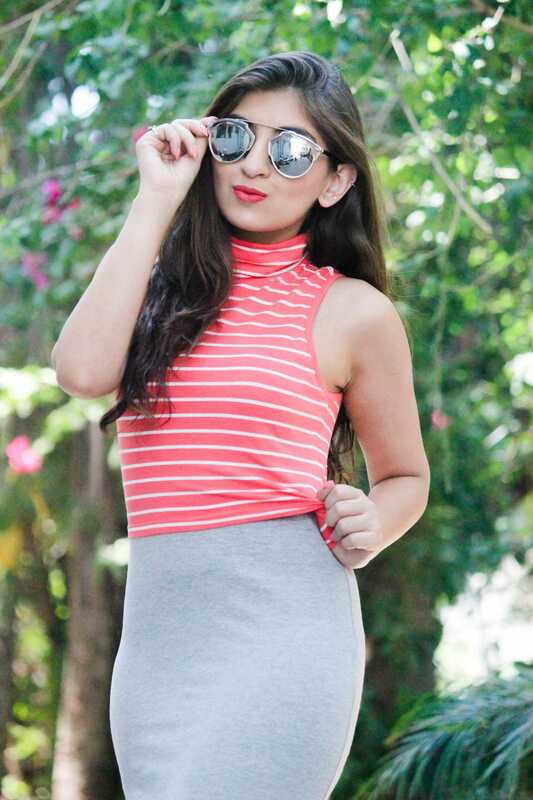 Since the maxi was quite simple, I paired it up with this really fun & cute turtle neck crop top from Forever 21. It was adding the perfect casual touch to my outfit and it was really comfortable at the same time. This crop top could be paired with a plain bodycon midi skirt or pencil skirt as well, or simple high waist blue denims. I can not tell you, how much I love these matrix shaped reflectors. They literally go with any and every outfit. I got this pair from Fancypantsthestore.com. They have some latest collection of reflectors, shades etc. They also have really pretty apparel, shoes, and accessories. One should check out their collection. So as I was saying, sneakers are super comfy. I got these from Pull & Bear in Dubai. They have a huge collection of sneakers, denims & basics. I love this brand for their basics and sneakers. As you can see these are all white sneakers and they go with most outfits. You can say its the one pair of shoes I wear with dresses, denims, skirts, nearly everything. Most people worry about buying an all white sneakers as its difficult to clean it up, but this one really doesn't give me a hard time. I am in love with them and I would definitely recommend everyone to buy a pair of sneakers if you don't have one already. Hope you guys liked the pictures. It is an easy Street Style look!